Besides Customize your monitor, TV, or furniture with colorful LED lighting color to fit your mood! Vansky Multi Color RGB Bias Lighting is an ideal solution. Use the High-brightness LED Strip to light up or create festive lights on your monitor, TV, or furniture. Choose from solid colors, strobes, or cycling colors to fit your mood! You can easily swap between colors and lighting modes using the in-line remote on the Strip. Anywhere you have a port, you have brilliant and colorful LED lighting. The way you customize your lighting is only limited by your imagination! You can simply use the 5V 1A Universal USB Wall Charger included to power the led strip instead. 3.This Led Strip can be turn on/off the same time with the TV' power on/off,but get few exceptions as different TV version. 16 Color selection -- RGB led lights: white, red, green, blue, yellow, pink, purple, among others customize your work space with 27 vibrant LEDs to set the mood and illuminate your hardware. Alleviates eye-strain -- Adds a Subtle TV backlight to your monitor, reducing the eyestrain caused by differences in picture brightness from scene to scene in movies, shows and games. Optimal viewing experience -- The color and highlight brightness of the 27 LEDs are carefully calibrated, making blacks blacker and colors more vibrant. Easy Installation -- LED strip light is 35.4 Inch can be cut with scissors on the cut marks (white Lines) to fit the desired size of your TV. The usb cable is 47.5 inch. Use the 3m adhesive to attach to almost any surface, powered by any devices with output 5V 1A usb port. Just plug-and-play! Quality assurance -- High-brightness 27 LEDs last up to 100,000 LED lighting hours. 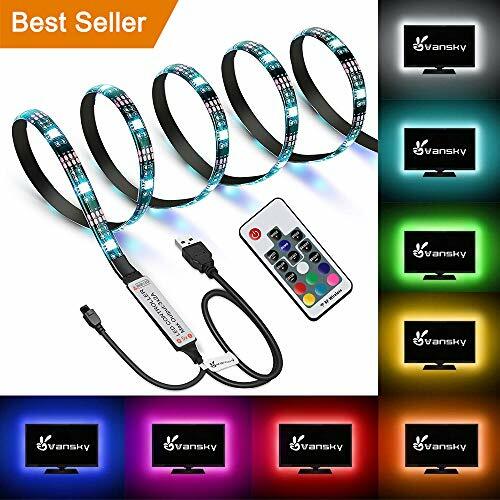 What you get- Vansky Bias Lighting LED strip light for TV, Wireless Remote Control,spare 3M adhesive tap, together with 45 days money back, one year guarantee and friendly, easy-to-reach support.